I want to offer this article towards a conceptual model for understanding the importance of getting adequate nutrient density from real foods. I come across many people who believe that relying on various commercial nutritional supplements is a valid option towards the control of health. While this may be true for a few specific examples, for most of the essential vitamins and nutrients, it is mostly false. One thing I seek to show, is that details make all the difference, and that relying on real food is the best option for health. Not all micro-nutrients can be treated by the same rules. Only a few types of essential micro-nutrients exist as a single unique small molecule with a characteristic structure. These types of nutrients are not members of a structurally diverse chemical family such as we will discuss in this article. These simple types of nutrients are generally OK to supplement, and there will be little difference to your health whether they come from real food or a capsule. Vitamins C and K2-MK4 are examples that fit this category, and are fine to supplement using their proper dosage profiles. Many other synthetic nutrients delivered in capsules, however, just can’t offer the same health benefits as their natural versions from real food. Some synthetic nutrients, in fact, are even likely to be detrimental to health in the long run. 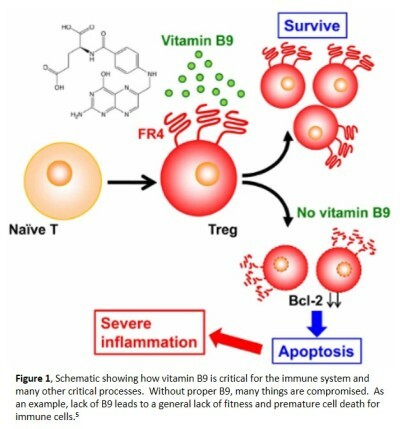 There are many reasons for this, but in this article we want to focus on vitamins B9 and D and use them as key examples. Specifically, we want to show that for many natural essential micro-nutrients found in foods, their synthetic versions just don’t work well. Two of the largest reasons for this are that firstly, the synthetics are often not even the same chemical compound at all, or secondly, because the synthetic version is a single member of a larger and more diverse chemical family. The single specific member derived synthetically is often a similar version that is easy to make industrially. In the real vitamin family, rather than existing as single organic compound, the vitamin exists as a large family of individual members, where each member often has a different specific role and unique impact on health. In many cases, all the particular actions and mechanisms of such families of nutrients are not well understood scientifically. The entire spectrum of natural nutrients are often hard to isolate from natural sources, or are difficult to replicate in the laboratory. Hard and difficult meaning “economically viable” in reality. For this reason, these types of supplements are poor substitutes for true nutrition, and long term usage can slowly erode health, causing a form of selective micro-starvation, often resulting in non-communicable age-related onset, or immune system related diseases. The above situation is why we stress the importance of learning to derive key nutritional density from real foods of the right types. For some readers, this might be the punch line of the executive synopsis. I’ll try to state concisely. “Don’t rely on synthetic vitamins too much, and try to get a lot of nutrient density from real non-process and organic foods”. If you like things short and sweet then there it is! You don’t need to read any further. Of course most have heard that before. Many just don’t believe it though. Or many might fail to give it enough importance? Some just don’t care to choose to be as healthy as they can, perhaps? For those that want an understanding of the chemical reasoning we use, however, and to understand the importance of staying the course and working to improve their understanding of nutrition, then please read on. While this article isn’t particularly short, I will attempt to describe the reasoning behind the importance of my statements above from a holistic biochemical perspective. My goal is to do so in lay terms and with a few fun analogies to make it easier to comprehend how it impacts health. To do this, we will focus on some new research findings for both vitamin families B9 and D as examples. These two are by no means isolated cases though. In fact the opposite. They outline a general theme in biochemistry. Hence many of the most important essential micro-nutrients follow similar rules to a larger or smaller degree. Vitamins and minerals are very important. It has become very clear to many in recent years that the humble compounds we call “vitamins”, “minerals” and “essential nutrients” are some of the most valuable resources on earth. If you don’t believe me, go to a desert island with a bag of groceries and a bag of cash. See which bag you give higher priority! Unfortunately, most people do not really understand this. Why? Perhaps, because vitamins and minerals have so long been taken for granted by society? Perhaps they have been driven into the background noise of a senseless commercial media buzz? Maybe because mostly their properties and practical usage guidelines are poorly understood and the quality of most commercial varieties are dubious at best? Perhaps because we are just too busy at work to feed our family top quality food and eat right? I used to think like that until I realized that a family or individual eating well is the main point of working anyway. That is right, I am suggesting that the most precious and health giving substances on earth are micro-nutrients, and that they have been forgotten and fallen under the radar in modern society. Driven into obscurity by mass market advertisements of active smiling silver haired adults, cartoon character chew-able gummies for kids, and hordes of prescription drug advertisements with lists of terrible sounding side effects that we should ignore when we take them because they are “normal”. When I look around though, people don’t generally look that “healthy” to me. National and global statistics don’t support robust health as we age either. Most people just don’t seem to hold up well past age 40 in most cases. Oh, we may live longer now, but the ailments we begin to hear friends, family, associates and selves starting to talk about at lunch begin to pile up. Well getting old isn’t fun…not for sissies is it? However, this doesn’t explain why the children are also strangely getting all sorts of problems at a young age now. Or why certain bellwether animals and insects are struggling. Or why the world seems to operate by strange and arcane sets of rules that don’t always make much sense anymore. Why is that? Modern science seems stumped? Well, it should not be stumped. Research and evidence abounds. The answer is simple. Without a naturally derived diet containing the full spectrum of vitamin, mineral and essential nutrients focused upwards by the “food chain”, our physiology just does not work properly. Additionally, our physiology is constantly bombarded by large hordes of industrial dietary toxins, biocides, and antibiotics with each meal and passing year. These bad chemicals are not helpful by far. All health starts in the gut. Even the ancients knew. The mythical gut/pituitary/thyroid axis perhaps, or even “leaky gut syndrome”? All good names for facets of the same. Maybe a better term for all these degenerative ailments past 40 might be “mal-adapted regulatory network disease”, or selective micro-starvation with concurrent induced toxicity and immune dysfunction? Here is an example of the subtle importance of terminology. An associate of mine was discussing his cardiologist’s assertion that exercise and statin drugs are “good” for his atherosclerotic condition. I didn’t touch the statin issue with him, but I did challenge my associate on the exercise front. I asked him to explain “how” the exercise would in fact remove the plaque in his soft tissues, when it appeared to be made of calcium? It was not clear to me how running or other highly oxidative forms of aerobic exercise would help to remove the calcium? He then explained that the cardiologist had told him that the exercise would trigger the heart to adapt and grow additional blood vessels so as to “bypass” the restriction. Now, I won’t argue with that mechanism. It is certainly known to exist. A great survival adaptation and testament to the amazing redundancy and plasticity coded into our physiques. “Good” on the other hand, is a subjective reference that depends on perspective and alternatives. One of terminology. In the situation of the blockage bypass adaptation however, I might counter argue that this is a “forced adaptation” to a life threatening blockage and might not be “good”. I would instead suggest that forcing the heart to undergo a large enough residual pressure stimulus for long enough to trigger adaptation might be pushing the red line a little from a mechanical and logistical perspective. In other words, by forcing blood continually against that restriction, it might not be so good for the other blood vessels in the area, if their mechanical integrity is compromised in various ways we might envision. I might also argue that forcing the body to build a whole bypass network of vasculature around the restriction is primarily a waste of time and resources (which are already likely in short demand anyway. If they weren’t, the person likely wouldn’t have the plaque in the first place…get it?). I might also argue that exercise does nothing to address the fact that the blockage shouldn’t be there in the first place, nor how it got there, nor what is to be done to stop further blockage, or how one might hope to reverse the process? Wouldn’t it be better to spend the same time and resources actually stopping the issues that cause the plaque to form in the first place? Possibly reversing the plaque forming mechanisms in the first place? This would take time and resources too. If we waste precious commodities growing secondary adaptive emergency vasculature then where will the time and resources needed to reverse the plaque formation tendencies come from? Won’t this require more resources? If a person doesn’t address the reason the plaque forms in the first place and then trigger mechanisms resulting in the removal of the existing plaque, then what happens when plaque starts to form in the “new” secondary vasculature around the blockage? Will we then grow new vasculature again around the now plugged emergency vasculature? Somehow I don’t like that logic? I was never able to get good answers to these questions from my associate, nor from my own cardiologist, when I used to employ him. The proof is all in the biochemical literature, animal model studies, the history of nutrition, and the study of traditional cultural diets and health metrics for certain ancient indigenous peoples in different ecosystems. It is very clear to any who look in the right places and connect the right dots. People should live good quality lives free from degenerative disease, tooth decay, auto-immune disorders, psoriasis, allergies, autism, diabetes, heart disease, cancer and many other things. It all stems from “lack of energy” in a way, and a lack of resources. Not a lack of exercise. The improper distribution and regulation of chemical energy and mechanisms within our tissues and cells is what leads to disease. Not lack of exercise. Babies grow in wombs just fine and no exercise is involved. No exercise is needed to keep the endocrine system balanced, the arteries clear and pliable, nor to keep calcium from precipitating in soft tissues. In fact, if not done very well, hard exercise past 40 can be detrimental for many people, if they are not well nutrified and don’t rest properly. It can accelerate the progression of regulatory disease. Now I am not against exercise. In fact, I love it. If done properly, I even agree it can be beneficial and improve health dramatically. I am just suggesting that is just not the panacea most people think it is, and that older people should take a hard look at nutrition before doing too much for too long. Nothing is free in nature. If a person repeatedly breaks their body down with exercise for long periods, they should make sure to build it back up with quality building blocks on a consistent basis and give it time to rest. If not, a person can erode the core regenerative systems of their body and create a house of cards waiting to crumble. I learned this lesson the hard way. The good news is that within 2 years I have come an amazing way back. I couldn’t do this before, even in my 30’s! Here is a little video! It is amazing. I have challenged so many of my friends and associates to this test. Practically none of my marathon running friends over 45 can do this, regardless of their BMI. Its mostly about diet. It has been shown historically that at least 12 distinct and dramatically different, simple, and health promoting ancestral diets provided their cultures with optimal nutrition, robust health, and all the quality of life free that is possible to flow from it. This is not true of all ancient traditional cultures. However, for the few special ones discussed here, they enjoyed high quality of life largely free from age related non-communicable disease far into the twilight of life. In fact, it is clear to many that the specific ancestral diets studied by Dr. Price outline the “entitlement of the human genome”. What our bodies have the “possibility” to be or what we are “entitled” to be. In this context, entitled, is a type of definition for the “best”. The best possible way of living for the complete and high fidelity expression of the human genome, with all the parts of the biosphere operating together as they are supposed to. Unfortunately, we can never really reach the “best”. We can, however, get arbitrarily close, as we have will, discipline, capability, and energy to do so. The last few traditional healthy diets outlined in 1939 by Weston A. Prices work, “Nutrition and Physical Degeneration”, no longer exist in today’s world. This is due to modernization, commercialization and centralization of the food supply. Even in those days, however, few such cultures remained in pristine ancestral condition. The continued progression and adulteration of our ancestral food supply has been going on for many hundreds of years now. Dr. Price was able to study the key attributes of dietary health at precisely the exact point in history to reveal the comparative observations of his work. The extraordinary diligence and purity of his work, in combination with modern biochemistry and biological sciences, allows the core health-unlocking elements of these diets to be broadly, if not deeply, understood in terms of practical dietary ramifications. More is quietly discovered each year. These health-unlocking elements can largely be replicated in today’s society by education, practice, and a few a key supplements and techniques. At least for those that are willing and able to complete the journey. This is what we seek to teach at Genesis BioHealth. We would simply like magnesium and MK4 business in return and along the way! All the better to help us spread the word with. If you like our articles and are learning something, please help us by using our excellent supplement products to achieve your health goals. Please see our “Six Tenets of Behavioral Health Article“, and our “Magnesium and Regenesis” products. Although it may be hard for many to believe, we are not a single organism. While our thoughts might seem like they are “singular”, and feel like “ours”, this is just not completely true. In fact, our thoughts, and all the biological processes of our bodies, are a result of the cooperation and competition of trillions of individual organisms and the countless chemical reactions that sustain them. We are a “We”. As strange as it is, our entire physiology and all it encompasses, is the result of complex chemical interactions between individual single celled organisms, each struggling individually to survive in the environment they are born into, just like any other living creature in existence. All the organisms that either compose our bodies, or symbiotically reside within them, are thought to contribute to something called our “hologenome”.7 It is an interesting theory of evolutionary biology, and whether this theory is specifically true or not, we can be absolutely sure it is true that the microbes and cells of our body cooperate, communicate and compete in ways so complex as to boggle the mind. It is almost surreal to think that our bodies actually use hordes of individual blob like creatures that cooperate to sniff out, chase down, surround and eat invading pathogens like packs of hungry wolves. Wolves responding to managerial direction from a hierarchy of regulatory biochemistry, manufactured by the genomic machinery of our DNA and stemming from the interactions of neurons in the jelly of our brain, spinal cord, vagus nerve, and GI tract. Cooperative single celled organisms build us, grow us, and direct us all the way up from a microscopic bit of slime with a few strands of DNA twisted around each other. Using DNA, entropy and a fractal foam of quantum energy flowing from alternative dimensions where only Schrodinger’s cat roams, we grow uncontrollably into a magnificent species of collective creatures competing, cooperating and resisting the environment and all its challenges. Our lives represent a constant battle of resource allocation, competition, cooperation and balance between microscopic creatures with nearly infinite communication complexity. One reason we sell magnesium at Genesis BioHealth, is because nearly all these biological process, and many more, depend on it in hundreds of ways! Without magnesium, all the bodies processes slow down, get turned off, or become compromised, while our DNA gets loose and floppy and the energy supply slows down. Not good! Anyway, back to the point. In the orderly, yet chaotic world of competing/cooperating cells described above, chemical communications and their linked rates become extremely important. Why do I keep harping away at “chemical communications” and their rates? Especially when the title of the article is about vitamins and their natural diversity? Can’t I come to the point? Well, not very well unfortunately. It is big weak point of mine. However, I will keep trying. Anyway, the structural diversity of the vitamins is the primary reason for the body’s diversity of enzymatic and hormonal systems. They go together like lock and key. Like the chicken or the egg. These incredibly networked regulatory systems of our bodies operate the orchestra of cellular and inter-cellular biochemistry that we call life. Many cells are like many people. In order to get things done, they need to talk to each other about lots of things and all the time! Let’s consider a non-chemistry example many might be familiar with. 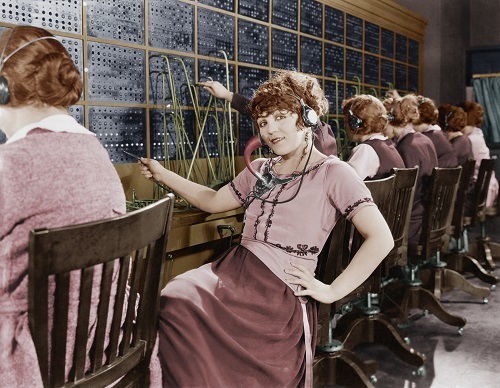 In this example, please think of the ability of one cell in our body to “talk” to another as an old style telephone switchboard, as shown in Figure 2. One name for this type of device is called a “multiplexer”. A multiplexer is a complex multi-faceted switch. Today, most multiplexer switches are completely computerized. This is because they had to outpace human capability to deal with so many connections and responses in today’s digital world and mega-cities. Multiplexer type switching is just the same as what happens when cells communicate too. However, the enormity of the switchboard is beyond comprehension. Nevertheless the functions are similar. In the body’s case though instead of wires, cells use secreted proteins and cellular receptors to send and receive information. In the case of certain structurally diverse vitamins, the available density of physiological switching states will then depend upon both the diversity of the vitamins, and their ability to activate different complex enzymatic response patterns. The cellular communications of our body are much like the communications that occur in a large modern city via a digital multiplexer. In order to accomplish tasks, the diversity of the vitamins in our natural fuel sources interact with an equal diversity of cellular receptor proteins, and their modalities. in our bodies. The permutations and combinations of the interactions between communication factors and their cellular receptors then act as the switchboard of cellular communications. These switches then allow our genes to be switched on and off, activating mission critical enzymes so that hordes of activities and resources can be controlled and managed throughout all the tissues of our body. The triggers and resulting actions that have already been discovered are nearly unlimited it seems. While the switchboard analogy is crude, it gets the point across. More importantly, we can use this analogy as a model to better understand why our body needs real foods with real vitamins and diverse essential nutrients. Our biochemistry needs these things instead of fake manufactured foods “fortified” with “synthetic chemicals” that somewhat behave like real vitamins if we test them in a certain simplified way. Chemical physics dictates that if we diminish the capability and diversity of one side of the lock and key like switching for our enzymatic multiplexer, then we will directly degrade the ability of our genome to activate the full range of diverse chemical regulatory biochemistry that our continued robust health requires. Limiting our bodies ability to activate key systems because it lacks the nutrients to do so will then negatively affect the ability of our body to communicate within itself. Perhaps more importantly, it might prevent our body from adapting to more complex and higher energy states. In fact, if proper resources are not present, our body has no choice but to adapt to the situation by adopting less complex and less energetic states. This will have negative impact on health and is not what we would like. What can the switchboard teach us about health? We will continue setting the stage for the scientific evidence we will present later. Setting the stage so that the information we discuss can better fit into proper context. In that regard, let’s extend the phone operator/multiplexer analogy even further. What if we have a largish city and a lot of people needing to talk all at the same time through our phone switches? People do this so as to coordinate all the work of the city each day and night. Imagine that we need 100 such multiplexer switches and 100 persons on each shift to operate them. These 100 operators can effectively handle all the “bandwidth” of communications necessary to operate the city at 100% effectiveness. These 100 switches and operators are all that is needed throughout the day and night to make sure the city runs at high fidelity. Trucks can get re-routed, ambulances can be directed to emergencies, the mayor, firemen, workers, moms, dads, factories, fuel trucks, gas-stations, and food markets can all work effectively with efficient communications and resource driven logistics. All through the city, communication fidelity will be key to effective resource allocation, coherent product output, timely raw material delivery, and all the other necessary orchestrations of an effective and cooperative society. The efficiency of all these processes depends completely upon the 100 switchboard operators and their ability to link messages going from originators to recipients, instantly and effortlessly whenever and wherever the need arises. What might happen if just one of the 100 total operators on the switchboard called in sick? Well, not much. I’m sure the system can bear offloading 1% of the total switching load to the other 99 operators. Our overall fidelity will not decrease much. The operators will just have to work a little faster and some callers might have to wait on hold a little while. A 1% bandwidth reduction will then have the potential to negatively impact all 100% of communications, thus reducing fidelity. What if 2 operators called in sick then? How about 5 or 10 even? For a while, our operators can work faster and we can ask callers to wait on hold. At least if the bandwidth reduction is not too drastic. Eventually though, something has to give. If we continue cutting switching capacity but the demand for communications remains, pretty soon our operators will start to fight, complain and eventually all quit or force a petition, protest, or something worse. We just simply can’t run an entire city at 100% fidelity with a large fraction of critical switching capability offline. What do you think would happen to the city if it was forced to run with 25-50% of its communication capacity permanently cut off? Well let me tell you…chaos would ensue for sure! It is not a good situation if we have to spread the impact of long term bandwidth reductions across the entire network. That tactic allows a small reduction in bandwidth, to negatively affect the entire city. If we think that we might get all our operators healthy and back working shortly, then it makes sense to try and fill in temporarily until we can resume full staff. This is cheaper than re-organizing and downsizing for the longer term. This is why we need administrators. A good Mayor will find a way to compartmentalize the negative impact, just like your body. He will know that he can limit the impact of bandwidth reductions and associated downsizing to less critical parts of the cities operations by making judicious cuts. However, there will be a cost to doing so as extra work and resources will need to be spent in the short term to achieve the cuts. If it becomes apparent that the reduction in operators will become permanent, then the investment in restructuring becomes the cheaper and better option. This means that if events continue to limit the cities switching capacity, then the city will begin shrinking and downsizing until more switching resources become available. Then, if resources ever do become available again, the city will have to undergo another costly re-organization to get back to its previous full capacity state. As a specific example, let’s say the city was forced to suffer a loss of 20% of its total communication bandwidth for an extended period of time. You are the mayor. How would you manage the rationing of information capacity? What about the priority of the resources and logistics these communications controlled? Would you cut all communications across the board? How would a good Mayor possibly cut some less essential communications first? How about the food, water, fuel, power and sanitation needs? Would we cut them first? I certainly would not. I might cut video game communications first. The analogy above is similar to a very important thing that happens when we don’t get enough, or the proper diversity of, essential nutrients into our body for extended periods of time. It forces the whole body to run on just a fraction of its total enzymatic switching capacity. This necessarily results in compromised resource allocations, jam-ups, re-organizations, and confusion of many sorts, both short and long term. Think of how a city would run over a 10 year period if 25% of its switching capacity was continually compromised? We know the Mayor can ration communications and their dependent resources in an organized way. How would the city run then? Would everything still work just as well? Do you think the budgets, energy distribution, resource allocations, schedules and timetables in the city would stay the same for long? Would we use as much energy? What about total productivity and output? I’ll leave it to the interested reader as a thought exercise? Suffice it to say that our bodies have to deal with exactly the same logistical and resource based physical limitations. Our selves just have to do so in a larger and more interconnected way. It is magnificent really, in my opinion. While there are many different types of chemical communications, they all have one similarity. This similarity is that cells or organelles somewhere (sometimes from microbes living in our guts) excrete chemicals that are detected by other processes, cellular organelles or cells (sometimes in our tissues). These communications can trigger and control staggering numbers of actions and processes throughout the body. The types of signals /actions / mechanisms and responses are far from completely understood and will not be in any near set of lifetimes. However, in the end, the concept is simple. Cells talk to one another to direct their cooperation and coordination. If this communication is compromised, then loss of fidelity ensues to a proportional degree. In other words, the more compromised these cellular communications are, the more disease we get over time. Figure 3 shows a simple qualitative hormonal signaling / cellular receptor model. All the organs in our bodies, as well as their auxiliary and support processes, will not work properly without effective hormonal signaling. In hormonal signaling, one tissue type, or a subgroup of cells in a tissue, might need to send or request a range of things like help, repair, a particular resource, a signal, some energy, or even a rescue call from physical or pathogenic attack. The list is seemingly endless and new receptors and interactions between cells are being discovered weekly. Guess what the activators, or the on-and-off switches, for many of these specialized communications pathways are? Right, the natural diversity of vitamins. The surface of every type of cell has hundreds, or even thousands, of different types of receptors. These are the mouths, eyes, ears and sense of touch for the cells. 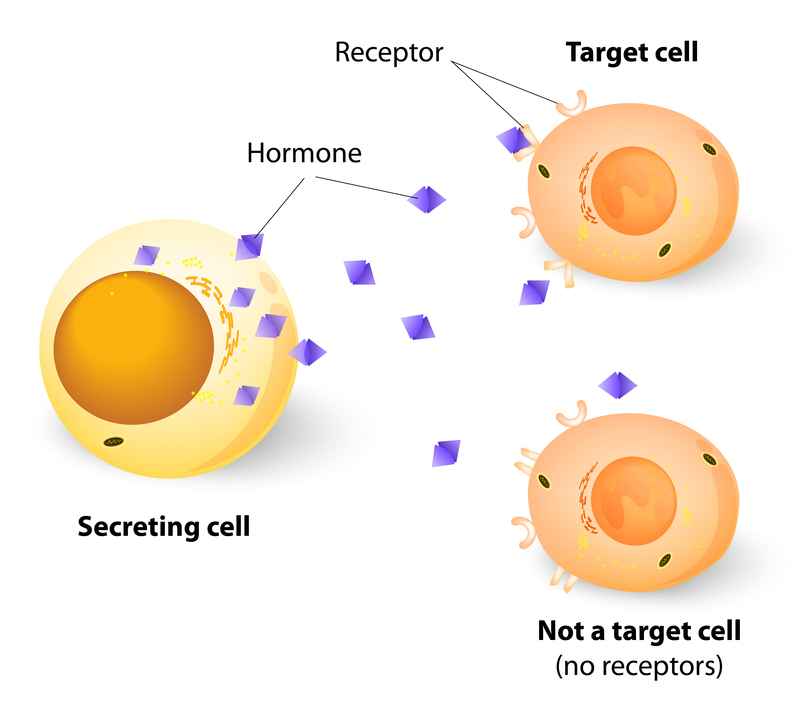 Each receptor sub-type is specially able to recognize a certain set of chemical signals that trigger specific actions inside or outside the cell. Why is this important? Well if cellular communication does not work effectively then neither do we. It is that simple. For instance what if our enzymatic fidelity runs at only 75% over the long haul? What would that do to our physiology? Well the body would have to adapt. It would have no choice. Just like the heart example I used above. Our physiology is wonderfully redundant and adaptive. It will shift the entire communication network, as best as possible, in order to neutralize any detected issues. This is one place where the chemical problems we call “disease” often start. When our communication network, and the resource allocation mechanisms it controls, are forced to undergo negative adaptations over a long period of time. Here is a video that shows how a specialized type of cellular receptor is activated by insulin. When this insulin receptor is activated by binding insulin, it triggers an energy and magnesium intensive process inside the cell that draws a transport protein up through the cell wall. This particular type of glucose transport protein is called “Glut-4″. When “Glut-4″ is drawn up through the cell wall after being triggered, it creates a type of pore that allows the transport of glucose through the cell wall. There are many other types of insulin receptor / glucose transporter protein combinations; this is just a single class. It does serve, however, as another example to illustrate the incredible diversity of chemical communications in our physiology. Why is nutrient diversity, enzyme switching, and chemical communication important to our discussion? Well most, if not all forms of age related disease, especially auto-immune or endocrine type diseases, can be linked heavily to dysfunction in these mechanisms. Failure of coordination between tissues, organs, cells, their organelles, or their genomic machinery. In this article, we will show evidence that our bodies are really made to require the full spectrum of nutrients in their natural forms to activate the full range of these communication functions. When we do this for long enough, our bodies will begin to work much better! It not so hard to learn to give the body what it needs to be more fully activated and healthy. In fact it works great! While many don’t know the formal definition of a vitamin, it is a “chemical” that is necessary to sustain life, but which must be obtained outside of our own body. As it turns out, many of our essential nutrients are supposed to come from bacteria that live in our GI tract, but that is another part of the story. However, the metabolites that these bacteria express for their own existence are considered “vitamins” to us, because we can’t express them, or can only do so in very limited quantities. Vitamins are essential nutrients that we must eat, or otherwise get into our body somehow, to survive. As it turns out, some of the most important essential nutrients are produced in nature as large structurally diverse families that really must be obtained from real food and not a synthetically “fortified” artificial food, or a “supplement”. Vitamins B, D, E, K are examples of vitamins that occur as a diverse family. Some vitamin families even have sub-families. Several members of the B family are like this. Specifically for this article we will discuss B9 more below. As it turns out, many types of vitamins, like B9, are being discovered to be much more complex than previously thought. We are also finding out that the health impacts for many of these nutrients are very dependent on getting natural varieties! The above is not true of all vitamins though. Some are not structurally diverse and the health impact they convey really doesn’t depend on whether they are natural or synthetic. Vitamins C and A are two such. In general, though, it is much better to rely on real food to obtain nutrition than on dietary supplements. This is precisely because of the diversity issue we describe, and also because we are quite sure there are yet undiscovered “vitamins” and “hormones” that come from diet. We are certain that some of these will be found to have major impacts on disease and aging. Where will they likely be found? In food and bacteria. Much like K2-MK4 was just less than 15 years ago, by some measure. More and more research is accumulating which clearly shows that effective functional activation of our genetic and cellular “switchboards” via enzymatic communication is highly dependent upon the natural diversity present in real foods. In the discussion above, I have worked to set the stage to help some to understand why. From an evolutionary perspective, it is largely because our chemical communication systems have learned to make use of all the diversity of our food supply. It is very reasonable to expect it to be so. Why would it be otherwise? Many of the most important “vitamins” (many are actually hormones, such as D and K) are now being discovered to behave this way. Now let’s get to some specific examples. Very recently a “first” discovery was made in a key vitamin affecting many areas of genetic health in humans. This discovery involves vitamin B9, otherwise called “folate” or “folic acid”. It was recently discovered that a single “bacterial” version of folate, which is only one of the many types of folate available in real foods, was the only version able to activate a key set of cellular machinery.1 This finding then implies that other members of the vitamin B9 family likely have unique roles in the body.1,2,3 The problem is that synthetic vitamin B9, is actually not a “folate” Instead, it is normally something called “folic acid”, which isn’t really even vitamin B9. Before driving on, let’s set the stage with some background info. The two terms commonly used to describe vitamin B9 are folate and folic acid. These two terms have begun to be used interchangeably in the last decades. The problem is that they are not the same compounds at all. Keep in mind that vitamin B9, or “folate” is an “essential” nutrient that our body needs. This means that we will die without it. Folic acid is not vitamin B9 though, as mentioned above! It can be converted to B9 in the human body to some degree, but it is not B9 itself. Even if folic acid were a member of the B9 family of “folates” though, it would only represent a single portion of the range of family members. As we have discussed above, we need all the prospective family members activating all of their respective enzymatic pathways in order to have the best chance for robust health to emerge. True starvation in the USA is hard to find. However, partial starvation is rampant. Vitamin B9 is a perfect example. People who eat too much food from cash crop foods fortified with “folic acid” instead of “folates” will likely be effectively B9 deficient. Foods like those made from seeds, such as: grains, beans, nuts and “vegetable” oils, are excellent examples of foods in this category. It matters not how much, or little fat, carbohydrates, protein or exercise are added to our lives. If you rely on foods fortified with synthetic B9, then your body will proportionally struggle to activate all of its B9 dependent pathways. Perhaps except the particular pathways able to be activated by the few types of folate created by the inefficient conversion of folic acid. As shown in references 1-3 & 6, it has recently been “proven” that folic acid cannot activate all folate receptors, and that they have different functions. As another example, imagine that rather than being completely out of vitamin B9, what if our body were just 20 or 30% short? Just like the telephone/city example above? Bad problems will eventually ensue in the body, just like in the city example above. For all the same logistical reasons. Eventually the energy budgets, communication pathways and number of signals sent each day will have to be down-regulated and down-adapted. This will result in adaptations to lower fidelity operations. In the body, some of our very sensitive genetic machinery will be absolutely compromised if we rely on mainly synthetic folic acid as is added to “fortified foods”. Foods such as “GMO grains” and other “cash crop” foods are fortified with folic acid, rather than natural folates as found in quality meats, dairy, vegetables and fruits. Specifically the immune system’s T cells and their ability to survive and function are dependent on Folates (Figure 1). The relative impact on health enabled by the diversity of folates, is only beginning to emerge. However, the results are quite clear to many. Natural diversity in vitamins is vitally important for health. It is a biochemical fact. Finally, the diversity of the B9 family, or the lack thereof, is not the only reason that the synthetic form is detrimental. Instead, there are three primary reasons that our cellular machinery is compromised by relying heavily on folic acid to the exclusion of adequate natural folate. The loss of diversity for enzymatic switching pathways. Interference with the chemical machinery that converts folic acid to folate in the human body by a common toxic herbicide called glyphosate used to grow the same food sources needing supplementation in the first place (GMO crops). Build up of unconverted folic acid toxicity in the body. The folate story supports and explains the mutual synergy and importance of “Behavior Health Tenets 2 & 3“. These tenets say that we should not eat foods from “seeds” and that we should maximize nutrient density. A final tidbit of info. The US FDA regulatory code requires that all GMO produced crops are “fortified” with “folic acid” since the late 1990’s. This was enacted to ensure that B9 deficiency does not occur in consumers of these artificially produced and modified foods. Too bad this doesn’t work as well for human health as it does for agricultural profitability. Evidence continues to emerge that folic acid works poorly in humans and is even detrimental to health if relied on as a staple.3 Gene modification of grains destroys the folate production machinery in the original crop due to the same genetic changes that make it resistant to glyphosate. Because of this known impact, folic acid is required by the FDA to be added to “fortify” the food. Problem is, as described, folic acid isn’t vitamin B9 and doesn’t do the same thing by a long shot. So, eating GMO crops and other seed based cash crop foods is not good for the structural diversity of folates and many other things! Unfortunately, it is not only vitamin B9. Evidence is mounting for vitamin D also.4 Vitamin D has turned out to be far more complex than ever realized. It is a hormone and not even a vitamin. Most importantly, it is more important for proper body functioning than realized, especially the workings of the immune and regulatory systems. Many other essential nutrients rely on the same functional diversity as do vitamins B9 and D. It is a general theme in biochemistry. Occurring as a complementing series of discoveries, some of the most bizarre and interesting research of the last decade is surrounding the impact of microbes that can colonize the GI system. They are now shown to have profound ability to actively up-regulate a host of newly discovered critical functions in both the endocrine and immune systems.5,6 Check out our recipe here for super-diverse natural probiotics that taste great and are cheap and fun to make. The diversity of the immune systems enzymatic regulatory network takes heavy advantage of the diversity of many natural vitamin families and other essential nutrients. A critical action to ensure a constant flow of nutrient diversity is accomplished by the proper cultivation and nurturing of diverse intestinal microbes by eating natural live and unpasteurized foods. If healthy colonies of diverse microbes are available in the GI-tract, they will manufacture the full spectrum of most of the types of essential micro-nutrients the human body needs. Not only that, a diverse microbiome of microbes will make just the right types our bodies need. Heavy antibiotic usage by modern medicine, and the preservatives in commercially produced foods now prevent this natural source of total nutrition from functioning effectively in most people. This results in severe limitations of total immune function, regulatory fidelity, and health building processes. The use of probiotics is the realm of “Behavioral Health Tenet 4“. The interaction of the immune and regulatory systems are much more powerful than people realize. Unfortunately, there is no way any set of synthetic vitamins can activate the incredible diversity and complexity only made possible by the hands of Mother Nature.